Welcome to the Bull Sharks Summer Swim Team. Cool off this summer and stay active by joining a swim team! Our team emphasizes great coaching, fun, achieving personal goals, and good sportsmanship while participating in competitive swimming. Why join OUR summer swim team? Our team focuses on Stroke Technique for all levels of swimmers. The coaching staff works toward growing each swimmer where they are and helping them achieve their personal best. Our team practices at an indoor facility and has free stroke clinics in an indoor facility. There is no need to worry with outside weather conditions interrupting workout sessions. Swimming is Great Aerobic Exercise – Swimming provides cardiovascular conditioning, while building longer, leaner muscles that can increase metabolism and improve overall health. 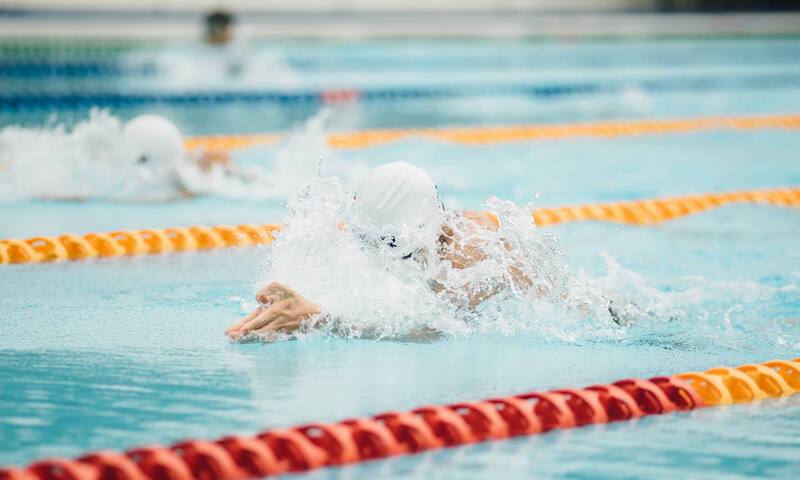 Swimming is a great Cross-Training Activity for All Types of Athletes – Swimming gives your body a rest from higher-impact sports and can allow the body time to recover and avoid injury. Research shows that swimming can improve asthma symptoms. Swimming can increase lung capacity by forcing the lungs to work hard to supply oxygen to the body and thus over time decreasing asthma symptoms. While we encourage attendance at practice and meets, it is not mandatory. Our team is flexible and you can work around your summer plans. Our team welcomes all levels of swimmers. The only requirement is the ability to be able to swim 25 yards unassisted of freestyle and 25 yards unassisted of backstroke and the swimmer should feel comfortable in the water without an instructor in the water nearby. Our experienced head coach will tailor each practice to fit the needs of each swimmer’s abilities. There is a place for beginners through the most competitive swimmers. The Bull Shark Swim Team is a great opportunity for those swimmers who want to work hard yet still have fun. We have opened registration and is $185 for the first swimmer and $145 for each additional swimmer. The registration fee includes a Bull Shark cap, all practice in the months of May-July, all TAAF fees and fees to participate in A regionals, B regionals and/or the state meet upon qualification. We do have some scholarship opportunities, please contact coach JO if this is something you need. Registration ends June 20th. The required equipment for practice include: a swimsuit (one piece for girls), goggles, and swim fins (Coach has some that can be used at the pool at a first come first serve basis). The requirements for the meets include: black swimsuit (optional), Bull Sharks cap, and goggles. Farmers Branch Bull Sharks is an amateur youth swim team competing under TAAF (Texas Amateur Athletic Federation). We are a not-for-profit group managed by parent volunteers. It is the mission of the Farmers Branch Bull Sharks organization to promote the sport of swimming to the youth of our community by offering a summer league program with quality instruction. We value the education of our youth, the development of their skills in swimming, and the positive support of the families involved in their growth. We will return your call or email ASAP. Please keep in mind that we are volunteer run and do not staff an office.